I believe a collection of bonsai pictures is a valuable mental property to every bonsai fanciers. I myself take and also collect well-taken photos of bonsai trees whenever I can. Simply, that’s because such photos please my passion. I love bonsai, and I want to record aspects of my hobby. Enjoying a miniature tree picture gives me a feeling of being a giant: I am bigger than an aged tree. Looking at bonsai forest photos make me think I’m wandering in a real forest. Maybe just looking at bonsai pictures, especially what I took myself, life is more pretty and meaningful. Secondly, bonsai photos help to keep graceful images for later usage. For instance, when admiring somebody’s bonsai masterpiece, I can neither stand there staring at it too long, nor have many chances to see it again. Then, taking photos help me to keep the digital images with me forever. That in turn serves for two meaningful purposes: (1) to view it again whenever I want; and (2): to learn and follow the way how a bonsai master created a masterpiece, which will surely increase my bonsai vision and techniques. Thirdly, pictures help bonsai growers track the development of their trees in chronicle timeline. It’s great to sometimes look back and see how you created a bonsai work of art. If unfortunately you fail, however, this would also help to draw useful trial and error lessons. You’re likely to realize what you’ve done incorrectly with regard to take care of your trees. Drawing lessons, adjusting methods, and keep trying will drive you closer to your success in the art. 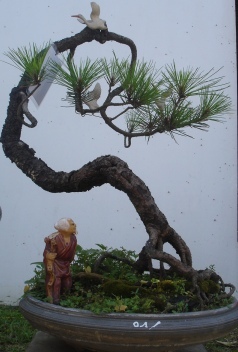 Recently, with support of image editing software like Photoshop, pictures taken from different angles of pre-bonsai trees can help bonsai growers do thoroughly research on computer, then creatively design, and choose the favorite bonsai styles before proceed to train the tree in practice. Final but not least, a good collection of bonsai tree pictures is also your supporting evidence of your bonsai knowledge and techniques. Showing them to your bonsai friends will get you authentication and admiration that you deserve. So, having thought like that, I myself keep taking photos of bonsai trees, either my trees or somebody else’s, whenever it’s possible. I’m happy with my collection and keep adding more to it. What about you? Do you also have your own bonsai pictures and really happy with them? If you do, you may wish to share some of your pictures here and tell some story about them, so that I and other bonsai enthusiasts can also enjoy together with you.